When Germany invaded the Soviet Union in the summer of 1941, Stalin requested help from the Western Allies. The result was the Arctic Convoys - the opening of a sea route from Britain to Northern Russia, used to supply the Soviets with vitally-needed war materials. This route passed close to German-occupied Norway, and so in January 1942 the newly-completed battleship Tirpitz - sister of the Bismarck - was sent there, to form the core of the naval force stationed in Northern Norway to intercept these convoys. For more than two years, Tirpitz remained a latent threat to the Allies, and despite fuel shortages her occasional sorties posed a grave threat to Allied shipping. So, the sinking of the battleship became a major priority for the British. The fjords where she lurked were strongly-defended, rendering naval attack virtually impossible. So, unless she could be caught at sea, she had to be destroyed by other means. In the spring of 1942 the Royal Air Force launched three heavy bombing raids on the battleship's anchorage, but no hits were scored. The following autumn she was damaged during a midget submarine attack, and moved to a more secure anchorage. A lack of bombers caused a hiatus in these air attacks, but they were resumed in 1944, by which time the Fleet Air Arm had the resources to join in the air campaign. The most sustained of these naval air operations was Operation Goodwood, but like the others, its results were disappointing. It was now clear that only heavy bombers dropping especially heavy bombs could do the job. So, that autumn the RAF launched the first of three large-scale attacks using Lancaster bombers armed with enormous Tallboy bombs. In the first, codenamed Operation Parvane, the Tirpitz was badly damaged. In the third air attack, carried out in November 1944, the battleship was hit three times, and she capsized and sank, taking most of her crew down with her. Her passing broke German naval power in Arctic waters, which in turn allowed the Allies to divert their naval resources to the Pacific, where the ocean-wide campaign was reaching its climax. 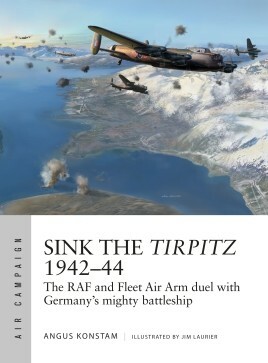 The air campaign against the Tirpitz was one of vital strategic importance, and while low-key compared to air operations over mainland Europe, it was one where a single bomb could dramatically influence the course of the war. These British airmen faced tough opposition from the weather, terrain, ground defences, the Luftwaffe and from the well-armed battleship herself, which, while rendering it tough for them, make this a dramatic story of air power's triumph against the odds. Technically, the 1944 air campaign was a test bed for a new generation of super-bomb. The Tallboy, designed by Barnes-Wallis of Dambuster fame, was a five ton "seismic bomb", capable of destroying the battleship when other more conventional ordnance had failed. These ground-breaking bombs were the forerunners of the devastating bunker-busting weaponry of the post-war era. 96 pages.